British-based Ladbrokes is one of the largest bookmakers and racebooks online and on land. Lucrative promotions are a big reason for success of the brand, so let’s take a closer look at how you can benefit. Ladbrokes welcomes all new customers with free bets worth £/€20. This promotion is only open to new customers creating a new account for the first time. 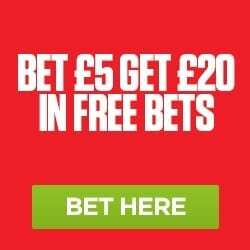 Sign up to Ladbrokes and get your £20 in FREE BETS! Claiming the bonus requires that you use the promo code 20FREE during the registration process. After registering your new account, you must make a deposit into your account of at least £/€5. Then, place a bet of at least £5! You can make your wager via the website or mobile app, but the wager must be a single bet and have odds of at least ½. 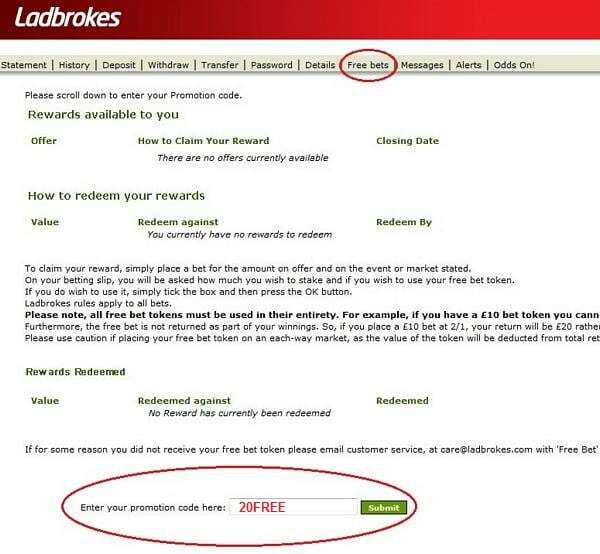 You must first place a bet and then Ladbrokes will give you four (4) free bet coupons worth £5 each! That’s a 400% welcome bonus worth a total of £20! The minimum bet you may place is £/€5, in which case you will receive a £/€5 free bet. Once your initial bet has settled, Ladbrokes will credit your account with your free bets. It doesn’t matter if your first bet won or lost. The value of your free bet coupons will be £5 each and you will receive four of these. Once credited, you have FOUR days to use your free bets or they will become null and void. Your free bet can be placed on any odds or kind of wager that you choose. However, free bets aren’t refundable, which means that you’d lose it in the event of a match or race cancellation, and the stake portion of a free bet is never returned. 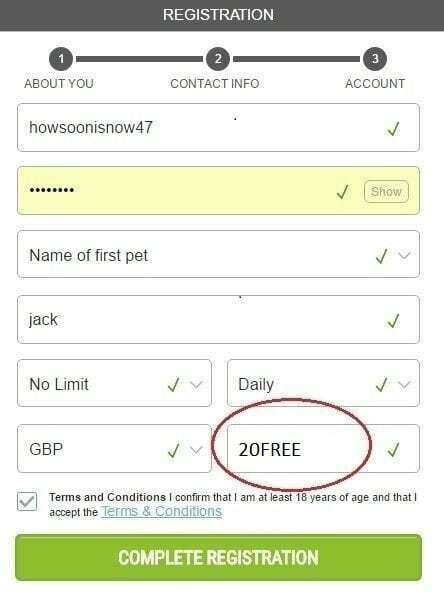 If your free bet wins, all winnings are pre-cleared, and you’re free to do with them as you please, including withdraw the money. Click here to read further details about this Ladbrokes promotion code. A new season of the Premier League is on the horizon, and Ladbrokes is celebrating that the way it usually does, with special price boosts. In fact, Ladbrokes is offering Premier League Countdown Boosts on every single team in the division. For instance, Hull, which was at 12/1 to finish Top 10, received a countdown boost that increased that wager to a whopping 18/1! These increases are far beyond what you’d expect from the usual daily price boosts. Be mindful that, once posted, boosts are only available for a limited time and those odds aren’t guaranteed. Additionally, the boosted odds are only available on single bets, and the maximum stake is restricted to £50. Price boosting will begin on July 24 and continue through August 12. Each day, there’ll be one new price boost between 8am-12pm, 12-3pm, 3-6pm and 6-10pm for a total of four new boosts each day and 80 unique boosts overall. Daily price boosts are a Ladbrokes feature that are available for horse racing, greyhounds and across most of the major sports markets that the service covers. A boost is essentially bonus money added to an event via odds that are increased in favor of bettors. Boosts aren’t just meant to draw odds in line with the best available online and will often exceed them. Generally, boosts are reserved for pre-match/race wagers, which means that you have to place your bet before the event begins. Boosts are usually posted early, but if you happen to place a wager at the non-boosted price, Ladbrokes will automatically upgrade your bet to the more favorable odds. Ladbrokes offers a best odds guarantee on most U.K. horse and greyhound races that it covers and many others. 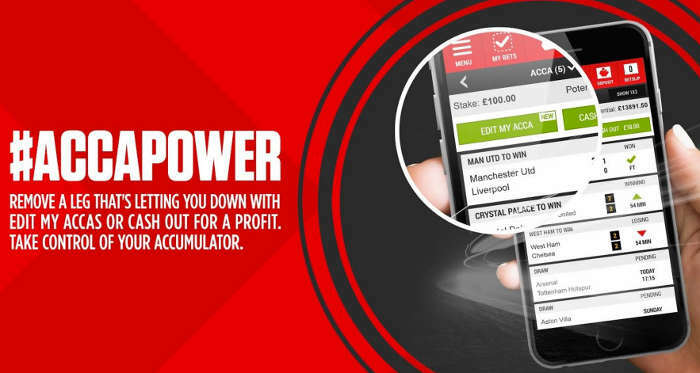 This guarantee means that if you place a bet on a race and the starting price is more favorable, Ladbrokes will automatically increase your wager to the SP. For instance, if you bet on a BOG race at 3/1 and your bet won at an SP of 7/2, then your wager would pay out at 7/2. Best odds guaranteed plus or BOG+ is similar except that the final price is boosted to the next level beyond the SP. For instance, if you bet on a BOG+ race at 3/1 and your bet won at an SP of 7/2, then your wager would pay out at 4/1. Note that BOG and BOG+ only apply to wagers up to a maximum stake of £/€200. If you bet accas, then you know how frustrating it can be when a selection or two suddenly don’t look so promising due to injuries, weather or other circumstances. This is where Edit My Acca comes in, and it’s a really clever feature by Ladbrokes for people who enjoy accumulators. Perhaps the neatest aspect of Edit My Acca is that you can change the accumulator even after one or more matches have started. Game looks like a blowout, and you want to remove it? You can do that. Simply access the bet through the Edit My Acca feature on the website or mobile app. Each removable bet will have a red X, and the feature will even show you how your choices will affect your final odds. 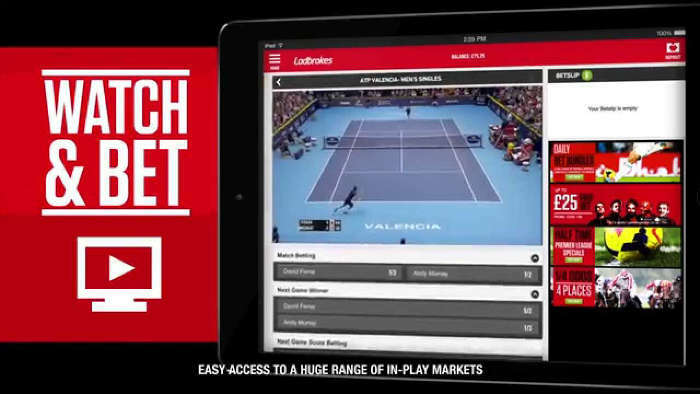 Ladbrokes offers live streaming via its website and mobile app, and the live streams are available for most U.K. horse racing and greyhound racing, most U.K. football matches, soccer matches from around the world and a wide range of other sporting events across the globe. Many online sportsbooks and racebooks offer live streaming, but most of them only extend that feature for events that you’ve actually placed a wager on. Ladbrokes is different. As long as you have a valid and active membership as well as a positive balance in your account — can be as little as 1p — you have access to all of the streams the service offers and can even watch multiple streams concurrently. Find other sources for free live streaming of football at LiveFootball4Free.com. Get your free bet today! Sign up to Ladbrokes Sports here! Be sure to also check out the Ladbrokes Casino! Get the free Ladbrokes Casino download here.